Grab a cerveza and celebrate Cinco de Mayo with these 15 incredible taco recipes. Crumbled Mexican chorizo adds delicious rich flavor to these shrimp tacos. Mexican dark beer such as Negra Modelo enhances the flavor of these fantastic tacos. These classic fish tacos feature tangy cabbage slaw. F&W Chef-in-Residence Andrew Zimmern serves these incredible crispy chicken tacos with avocado-tomatillo sauce. These vegetarian tacos are a fun Middle Eastern–meets–Mexican dish. Grilled scallions add fantastic sweetness to these fast chicken tacos. For an easy version of star chef José Andrés’s delicious tacos, use store-bought confit duck legs. Ready in just 20 minutes, these healthy tacos are made with a mix of red and green cabbage. Protein–rich black beans star in these incredible pork tacos. Tart avocado salsa accompanies these delicious pulled pork tacos. These addictive bacon tacos are pressed on a griddle, and feature three cheeses. These simple steak tacos are inspired by bare-bones taquerias. 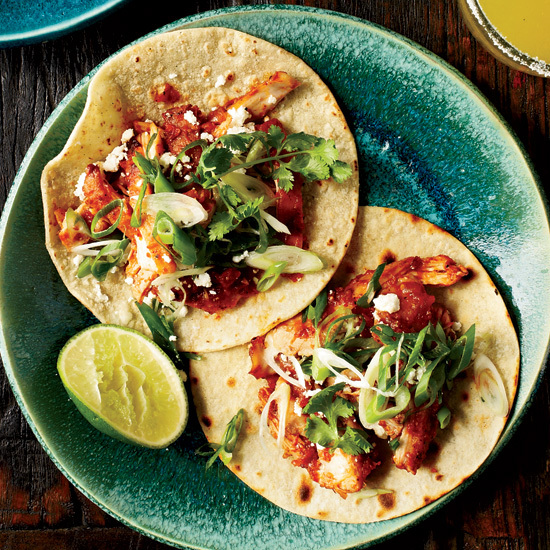 Bobby Flay’s terrific tacos are served with a tomato-mint salsa. Quick and easy to make, these delicious shrimp tacos are made with edamame and corn laced with lime juice and crema, a tangy blend of avocado and Greek yogurt.